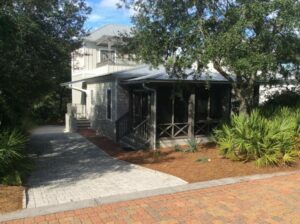 Just listed 30A home in Magnolia Cottages by the Sea. Located on the east end of 30A just west of Alys Beach, this beach home features 3 bedrooms, 3 bathrooms, deeded beach access, wood floors. stainless steel appliances, granite countertops, a large screened porch, and 1,511 sq. ft. of heated and cooled space. Located in the community of Magnolia Cottages by the Sea and just two lots from the community pool this home is rental ready with 2014 rental income of around $42k. Contact us today to schedule a private showing of this adorable cottage in Magnolia Cottages by the Sea. Contact us at The Beach Group at 850.231.9007 for more information on 30A real estate. This entry was posted in 30A, Seacrest Beach and tagged 30A beach cottage, 30A East real estate. Bookmark the permalink.